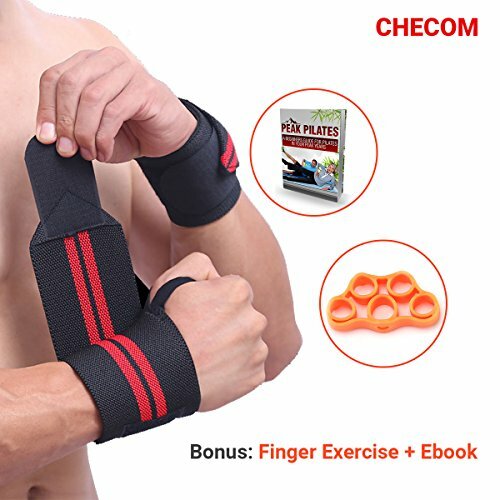 If you are a weightlifting, bodybuiding, cross-fit, fitness trainer and you need a tool to strengthen your wrist as well as your arm with effectiveness and convenience, our CHECOM Wrist Wraps is the most perfect choice for your consideration. Our product is easy to keep in place because of the handy thumb loop - FIRM BUT NOT RESTRICTIVE. You just need few seconds to set it ready and this will never waste your time and efforts at all! CHECOM Wrist Wraps make a great gift for your favorite athlete. They are a must in every athlete’s gym bag. Our bonus attached is such worth addition to your training from fingers to arm. it will definitely never disappoints your desire of a fit and healthy! Your satisfaction - our priority! A Thoughtful Gift To your beloved ones! Offer your loved friend, co-worker or spouse and anyone suffering from unqualified wrist wrap out item they need to build up muscle and strength ! Crafted to perfection from premium materials and offered at an unbeatable price, wrap makes the perfect gift that will show off your care and good taste! Scroll Down & Click “Add To Cart” NOW While Supplies Last! ✅ ONE SIZE FOR ALL OF YOU - This design is designed for both men and women. Our product is 19.7’’ long and 3.15’’ wide - much longer than the majority in the market , that means it can work more effectively and fit for all of you! Let’s see how it perfectly fits for your hands! ✅ GET A TREMENDOUS VALUE SET! We are offering you MORE than most suppliers of similar products! We have added to your wrist wrap pack of an UNIQUE BONUSE, adding GREAT VALUE to your shopping experience! Get the finger exercise trainer, absolutely free of charge and see how your hands from finger to arm being stronger day-by-day! If you have any questions about this product by CHECOM, contact us by completing and submitting the form below. If you are looking for a specif part number, please include it with your message.